Today we have a new trailer from Sacred Citadel, the side-scrolling beat'em-up which takes place in the Sacred universe. In the brief video we are introduced to the Seraphim Mage, who apparently has no need of pants. If you've seen the other character videos you'll recognize the tune. This is the final playable playable character in Sacred Citadel. Wielding mighty spells, she joins the Ancarian Ranger, Khukuri Shaman, and Safiri Warrior. 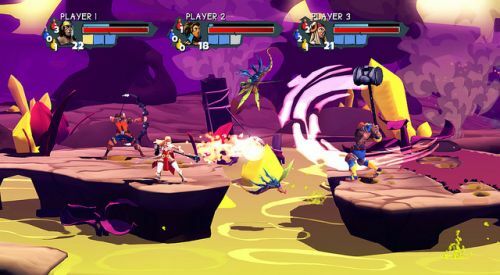 Sacred Citadel is a nice throw back to arcade co-op brawlers like Teenage Mutant Ninja Turtles and X-Men. We got some hands-on time with the game at PAX last year. It's simple, button-mashing fun you can enjoy with a few friends. Sacred Citadel will support three player online co-op and three player local co-op. It will launch on April 16th on the PlayStation Network and April 17th on the PC and Xbox 360. It's priced at $14.99 or 1200 MSP. Page created in 0.3051 seconds.